MSRP $62,450. Discounts in the form of manufacturer rebates and dealer discounts. Price plus tax, tag and license. Must finance with Chrysler Capital. Not all buyers will qualify. See dealer for details. Stk #JG155693. Expires 4/30/19. MSRP $57,370. Discounts in the form of manufacturer rebates and dealer discounts. Price plus tax, tag and license. Must finance with Chrysler Capital. Not all buyers will qualify. See dealer for details. Stk #JS355793. Expires 4/30/19. MSRP $34,810. Price plus tax, tag, license and dealer fees. Must finance with Chrysler Capital. See dealer for details. Stk #JL805299. Expires 4/30/19. Service your vehicle at our Bob Moore Chrysler Dodge Jeep Ram Tulsa today with our factory trained and certified technicians. Great customer service! Members were patient and work with me so that I could get the best rate and payment possible. Thanks Bob Moore Team! Excellent Service! I have used the Bob Moore Service Center for many years and have always been very satisfied with their work. I am very cautious about taking my vehicles just anywhere and they have always taken very good care of us. Incredible Customer Service! We just bought our sons car with these guys and it was actually a fun experience!! Lucas and Brandon along with the financial team were amazing, was not an all day event! 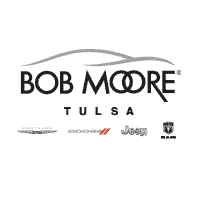 I recommend Bob Moore Chrysler Dodge Jeep Ram of Tulsa!!! A big Thank you to their TEAM! You all did a good job. I do think that making proper adjustment to tire pressure should be a part of the tire rotation program.denver. Bob Moore Chrysler Dodge Jeep Ram Tulsa is thrilled to support our partners in the Tulsa community.